It occurred to me, over the weekend, to take a look at the electoral dynamics of Queensland’s plan to appropriate the output of household solar at a fixed (low) wholesale price, and force households to buy all their electricity at the retail rate. It seems to be a very bad idea, electorally. For my analysis, I decided to use the state of the Queensland parliament before this year’s electoral rout that saw the ALP decimated – because that would skew the results. After all, right now the ALP is a mere rump in the Queensland parliament. As it now stands, nearly all of the PV installations are in conservative seats; the analysis wouldn’t tell us anything. So I reverted to the previous parliament, in which the ALP held 51 seats. The data for solar installations was sourced from Australia’s Clean Energy Regulator, which http://ret.cleanenergyregulator.gov.au/REC-Registry/Data-reports reports PV installations by postcode. In Grass-GIS, the open source GIS package, I associated the postcodes with electorates as a simple overlay. This yields a map in which the areas within each electorate can be matched to the postcode-based reporting of solar PV installations. Note also that “conservative” electorates aren’t just the LNP electorates: they include seats that were held by conservative-leaning independents. On average, have more than triple the solar power per electorate. The situation now – in which the ALP only retains seven seats in the state parliament – would be worse. The image below provides a visualisation of the analysis. Pink-red shows formerly ALP electorates according to the amount of solar installed in the area; blues illustrate the same in Conservative electorates. 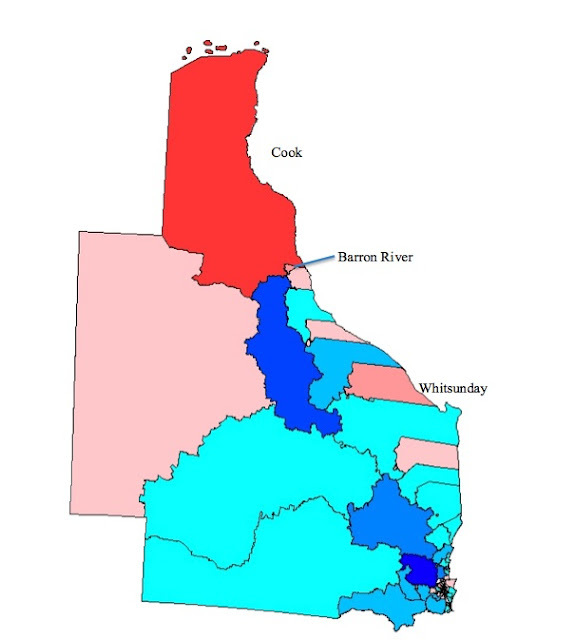 The three electorates I picked out - Cook, Barron River and Whitsunday - were among the mass that changed hands in the 2012 state election, and are now held by the LNP. They're also the "most solar" electorates that the ALP used to hold.